The current financial situation in the United States is on the precipice of major interest rate increases that will be precipitated by one of two events. The basis for both scenarios is the profligate monetary expansion undertaken by the Federal Reserve over the last year to address a perceived risk of deflation and purchasing bonds from the Treasury to artificially hold down interest rates. This current trend of monetary expansion cannot be sustained indefinitely without consequence. At some point in the near future, the Federal Reserve will be forced to decide whether to tighten the access to credit. 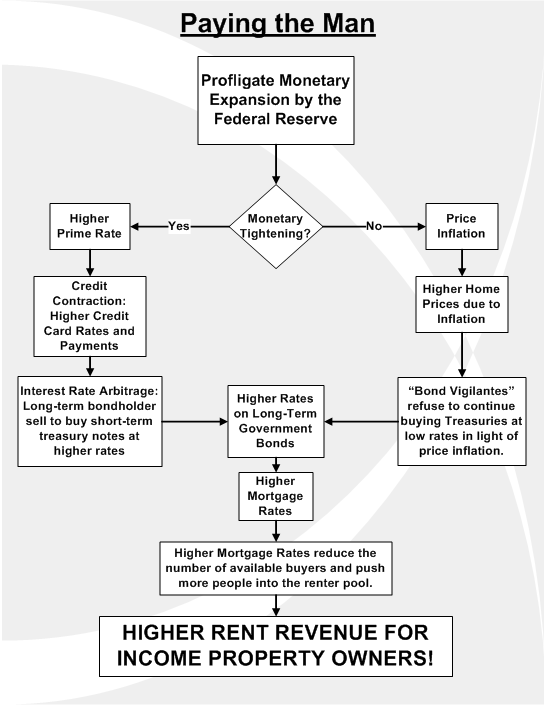 In order to stem monetary inflation, the Federal Reserve will need to raise interest rates in order to contract the availability of money in the system. 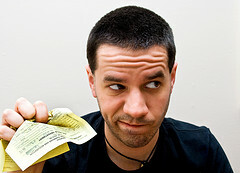 If this happens, it will result in a higher prime rate and higher credit card rates. This will increase the yield on short-term treasury notes, and will prompt many bond investors to sell their long-term bonds to purchase shorter term notes with higher yields. As more people sell their long-term bonds, it will push down prices and force up the yield. 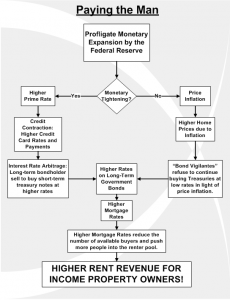 Another option for the Federal Reserve is simply allowing price inflation to roll through the economy. This will happen as credit markets normalize, and more dollars end up chasing fewer goods and services. This will inevitably result in higher prices for consumer and capital goods, including housing. As prices continue to increase, a resurgence of the ‘bond vigilantes’ will occur as more people refuse to buy government bonds at the current low rates. As the government needs to discount their bond offerings to clear the inventory, it will push up effective interest rates on long-term bonds. Regardless of which event transpires, there is an extremely high likelihood that long-term bond rates are headed up in the near future. This phenomenon will also push up mortgage rates since most mortgages are indexed against government bonds. As the mortgage rates continue to increase, the number of people in the pool of home buyers will decrease because higher rates translate into less buying power per dollar of monthly payment that a person can afford. As more people transition out of the home buyer pool into the renter pool, it will increase demand for rental housing. This increase in demand will eventually manifest itself in higher rents as the supply of rental housing adjusts more slowly than the movement of people into the renter pool. An important factor to consider is that income property owners will benefit greatly from this effect, as it will place upward pressure on rents. These increased rents will provide additional cash flow to people who bought at low fixed rates and locked-in their cost of borrowing for three decades. The most important point of this unfolding event is the fact that the window of opportunity to act will be closed very soon. Once inflation begins to occur, or monetary tightening commences, it will be too late to capture the best deals that are currently in the marketplace. The reason is because either event will be quickly followed by a step-up in interest rates, which will decrease affordability for income property investors. Because of this, it is critical for prudent investors to act now and lock-in their cost of debt at the current low rates;this will protect you against the coming increases in interest rates by making them work to your advantage, instead of to your detriment. In the end, the United States has been enjoying artificially low interest rates for a very long time because of its position as the global reserve currency. Unfortunately, the government is nearing the point at which it can no longer absorb the profligate government spending with no detrimental impact. Ultimately, we must ‘pay the man’ at some point by enduring the market correction that must eventually result from current government policy. By taking action now, you can benefit handsomely from the coming economic disruptions while many other people are enduring the problems implicit with trying to get something for nothing.